Afshin Alipour received B.Sc. in mechanical engineering from the Amirkabir University of Technology, Tehran, Iran, in 2013. He pursued his M.Sc. in applied mechanics at the University of Tehran, Tehran, Iran. During his studies, he focused on fields of dynamics, control, vibrations and mechatronics which are his main interests. He worked on design, fabrication and control of a new robotic system for lower limb rehabilitation as his master thesis. He also worked on analytically evaluating non-linear behavior of beams in micro/nano scales. 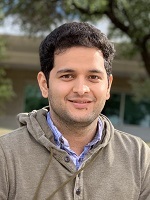 After graduating from the University of Tehran in 2016, he started his Ph.D. in mechanical engineering at the University of Texas at Dallas in 2017.